Karina's Kreations: Simply Created Thankful Tablescape Card! Simply Created Thankful Tablescape Card! I'm going to Millet on Sept 7th and joined a swap where we had to use the Simply Tablescape Kit to create a card. I love challenges and this one was really fun because there are so many fun pieces in this kit. It actually makes a beautiful decorated candle and place setting. Buy this kit and and your family will be calling you Martha Stewart! Hee Hee!! The code for this kit is #132164. This is my card and I had to use the Circle Card Thinlits Die #133480.This die just makes me happy!!! It's so quick & easy!! To make this card you'll need some Crumb Cake card stock. Cut it to 6" x 6" and it just fits the die!! 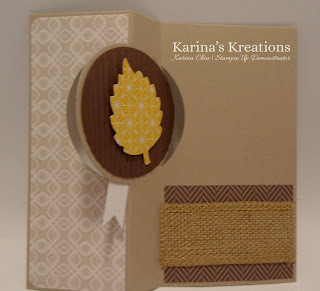 You also need Burlap Ribbon #132140, Harvest of Thanks stamp set #131739, Apothecary Accents Framelits #127003, Neutral Designer Buttons #130031 and Linen Thread 104199. I hope you love my card!! !